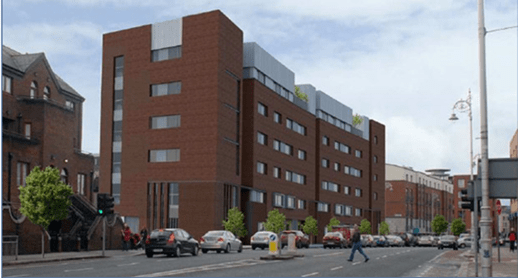 Sean Foster Apartment Development – Duggan Brothers Ltd.
We are delighted to announce that works have officially commenced on the ‘Sean Foster Apartment Development’ on North Kings Street. 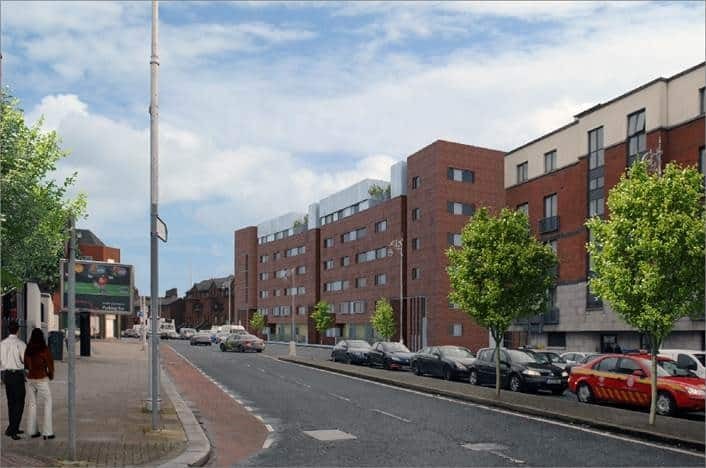 The 6 storey social housing development will comprise 30 apartments – 7 no.1-bedroom apartments; 18 no.2-bedroom apartments; 3 no.2-bedroom duplex apartments; and 2 no.3-bedroom apartments. Each apartment has dual aspect and is design with a private balcony. Four apartments have triple aspect. A shared private courtyard is located along the southern boundary of the site. The new development has been named after “Sean Foster” as a mark of remembrance to the first child killed during the 1916 Easter Rising. Sean Foster was only 2 years old when he was killed by a gunshot to the head as he was wheeled in his pram along North King Street. North King Street was the centre of heavy fighting during the rebellion, which led to the death of 16 civilians on this street – 9 of which were killed on the site of the new development. The new apartment development will be NZEB compliant. NZEB stands for “nearly zero energy building” and is a low energy design bench mark for buildings with very high energy performance. In addition, the very low amount of energy that is used is provided from renewable energy sources. NZEB buildings set standards for carbon performance in addition to energy performance. The design development of this scheme ensured careful consideration of a range of solutions to meet NZEB energy targets.